Super Dove is such a nice cow. 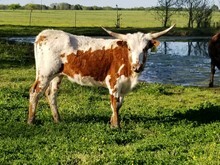 She is feminine, has great color, a sound udder, sound conformation, and major horn as a 6 year old. We love her.